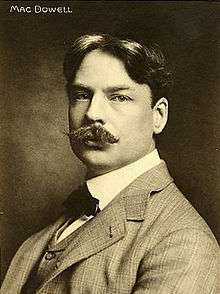 Edward MacDowell was born in New York City to Thomas MacDowell, a Manhattan milk dealer, and Frances (Fanny) Mary Knapp. He received his first piano lessons from Juan Buitrago, a Colombian violinist who was living with the MacDowell family at the time. He also received music lessons from friends of Buitrago, including the Cuban pianist Pablo Desverine and Venezuelan pianist and composer Teresa Carreño. MacDowell's mother decided to take her son to Paris, France, where in 1877 he was admitted to the Paris Conservatory after receiving a competitive scholarship for international students. After two years of studies under Antoine Marmontel and being at the top of his class, he continued his education at Dr. Hoch's Conservatory in Frankfurt, Germany, where he studied piano with Carl Heymann and composition with Joachim Raff. When Franz Liszt and Clara Schumann visited the conservatory in early 1880 and attended a recital of student compositions, MacDowell performed Robert Schumann's Quintet, Op. 44 along with a transcription of a Liszt symphonic poem. Next year, he paid a visit to Liszt in Weimar and performed some of his own compositions. Liszt recommended MacDowell's First Modern Suite, Op. 10 to Allgemeiner Deutscher Musikverein for performance and also introduced him to Leipzig music publishers at Breitkopf & Härtel. After finishing his studies in 1881, MacDowell remained for a while in Germany, where he composed, performed on stage and gave piano lessons. He taught piano in Darmstadt during 1881–1884, including at the Schmitt's Akademie für Tonkunst (now known as the Akademie für Tonkunst), and in Wiesbaden, 1884–1888. In Germany, the MacDowells settled first in Frankfurt, then in Darmstadt, and finally, in Wiesbaden. From 1885 to 1888 MacDowell devoted himself almost exclusively to composition. That brought financial difficulties, and he decided to return to the United States in the autumn of 1888. He made Boston his new home, where he became well known as a concert pianist and piano teacher. He performed in recitals with the Boston Symphony Orchestra and other American musical organizations. The MacDowells lived in Boston until 1896, when Edward was appointed professor of music at Columbia University, the first music professor in the university's history. He was personally invited to Columbia University by its president Seth Low to create a music department. He stayed at Columbia until 1904. In addition to composing and teaching, from 1896 to 1898 he directed the Mendelssohn Glee Club. MacDowell composed some music for the group to perform. In 1896, Marian MacDowell purchased Hillcrest Farm, to serve as their summer residence in Peterborough, New Hampshire. MacDowell found his creativity flourished in the beautiful rural setting. His compositions included two piano concertos, two orchestral suites, four symphonic poems, four piano sonatas, piano suites, and songs. He also published dozens of piano transcriptions of mostly 18th century pre-piano keyboard pieces. MacDowell was also a noted teacher of the piano, and his students included John Pierce Langs, a student from Buffalo, New York, with whom he became very close friends. Langs was also close to noted Canadian pianist Harold Bradley, and both championed MacDowell's piano compositions. The linguist Edward Sapir was also among his students. MacDowell was often stressed in his position at Columbia University, due to both administrative duties and growing conflict with the new university president Nicholas Murray Butler around a proposed two-course requirement in fine arts for all undergraduate students, as well as creation of combined Department of Fine Arts overseeing music, sculpture, painting and comparative literature. :243 After Butler stripped Columbia faculty members in the arts of voting rights and accused MacDowell of unprofessional conduct and sloppy teaching, in February 1904, MacDowell abruptly announced his resignation raising an unfortunate public controversy. After stepping down from Columbia professorship, MacDowell fell into depression and his health rapidly deteriorated. E. Douglas Bomberger's biography notes that MacDowell suffered from seasonal affective disorder throughout his life, and often made decisions with negative implications in the darkest months of the year. Bomberger advances a new theory for the sudden decline of MacDowell's health: bromide poisoning, which was sometimes mistaken for paresis at the time, as it was the case with MacDowell's death certificate. Indeed, MacDowell had long suffered from insomnia, and potassium bromide or sodium bromide were the standard treatment for that condition, and in fact were used in many common remedies of the day. 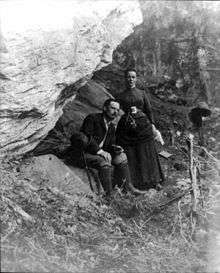 MacDowell also was in contact with bromides through his avid hobby of photography. A 1904 accident in which MacDowell was run over by a Hansom cab on Broadway may have contributed to his growing psychiatric disorder and resulting dementia. Of his final years, Lawrence Gilman, a contemporary, described: "His mind became as that of a little child. He sat quietly, day after day, in a chair by a window, smiling patiently from time to time at those about him, turning the pages of a book of fairy tales that seemed to give him a definite pleasure, and greeting with a fugitive gleam of recognition certain of his more intimate friends." In 1896, Princeton University awarded MacDowell an honorary degree of Doctor of Music. In 1899, MacDowell was elected as the president of the Society of American Musicians and Composers (New York). 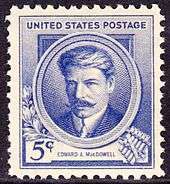 In 1904, MacDowell became one of the first seven people chosen for membership in the American Academy of Arts and Letters. After this experience, the MacDowells envisioned establishing a colony for artists near their summer home in Peterborough, New Hampshire. In 1895, an "Op. 8 Waltz" for piano by MacDowell was listed by Breitkopf & Härtel, but no price was shown, and the piece was not published. Several of his works have been orchestrated for standard orchestra and chamber orchestra, the most popular being Nathan Kelly's orchestrations of the complete Woodland Sketches for chamber orchestra and solo clarinet. ↑ Until 1975, it was generally accepted that MacDowell's year of birth was 1861. A scholarly article in The Musical Quarterly corrected this error. 1 2 3 4 5 Alan Levy. MacDowell, Edward. American National Biography Online. February 2000. Retrieved December 18, 2015. 1 2 The Biographical Dictionary of America, vol. 7, p. 147. ↑ Gilman, Lawrence. Edward MacDowell: A Study. New York, 1909, p. 26. ↑ D. Pesce: "MacDowell, Edward", in: Grove Music Online, ed. Laura Macy. Accessed 7 January 2006. ↑ Baltzell, W. J. (ed. ): Critical and Historical Essays: Lectures Delivered at Columbia University by Edward MacDowell (Boston, 1912), pp. 288-289. ↑ Darnell, R. (1990). Edward Sapir: linguist, anthropologist, humanist. University of California press Berkeley & Los Angeles. p. 8. ISBN 0-520-06678-2. 1 2 Bomberger, E. Douglas: MacDowell (New York: Oxford University Press, 2013); ISBN 9780199899296. ↑ J. Madison Taylor, A.M., M.D. Bromide Poisoning Mistaken for Paresis, in: Monthly Cyclopaedia of Practical Medicine, volume 9 (5), May 1906, p. 193-195. ↑ Lawrence Gilman (1909), p. 54. 1 2 Edward Macdowell Inducted Into Classical Music Hall Of Fame, April 28, 2000. ↑ See: Introductory Note by Dr. Allan J Eastman, in: Etude: The Music Magazine, vol. 40, December 1922, p. 817. ↑ Chase, Gilbert: America's Music, from the Pilgrims to the Present (New York: McGraw-Hill Book Co., 1955), p. 364. ↑ Gillespie, John: Five Centuries of Keyboard Music: An Historical Survey of Music for Harpsichord and Piano (Belmont, CA: Wadsworth Pub. Co.), 1965, p. 313. ↑ Sonneck, Oscar: Catalogue of First Editions of Edward MacDowell (Library of Congress, 1917), page 9. This article incorporates text from a publication now in the public domain: Gilman, D. C.; Thurston, H. T.; Colby, F. M., eds. (1905). "MacDowell, Edward Alexander". New International Encyclopedia. XII (1st ed.). New York: Dodd, Mead. p. 608.